For the past 30 years, we've all heard how American kids are alarmingly behind in mathematics. This inevitably leads to economic disaster, as we fall technologically behind. ...Or, so the argument goes. Is it too late for the US to catch up? Yet over that period, what has happened? The United States has extended its lead in technology over the rest of the world, in every meaningful category. 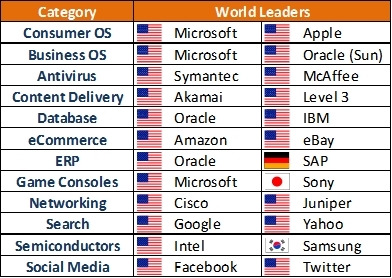 Take a look at the (admittedly unofficial) leaders in the most influential high-technology areas. So, if we're so bad at math, why are we utterly dominating in high technology? ...And those countries with the superstar math students for the past 30 year -- where are they in this list? Perhaps it's possible to be "good enough" in math, where any further obsessing hurts a country more than helping it. Here's why: Yes, we need math, but we don't need everybody to know the advanced stuff. Hell, my friends are a pretty impressive economic-value-adding cross section: lawyers, salespeople, engineers, scientists, and financiers. Do any of us use math more advanced than algebra and maybe basic trigonometry? The answer: Very few. I have one friend who works at Lincoln Labs, doing defense work for the government, who has a Phd in Physics from Harvard. He uses some pretty complex math. That's about it. My guess is that if a society has 5% of its population capable of performing advanced math , that's probably plenty. This doesn't mean that a modern society doesn't use lots of it, but just that usually a hyper-specialist develops it, and the rest of us use it. That's just how technology works: I don't need to reinvent the wireless packet loss optimization algorithm every time I send a text message from my iPhone. A small team of mathematicians did it once, and the rest of us just use it. "Maybe advanced mathematics isn't important, but basic mathematics is." I agree to a point. Most blue collar jobs likely require strong basic math (e.g. multiplication & division). White collar jobs could benefit from a strong grounding in algebra. Nevertheless, this doesn't appear to be a big technological bottleneck: It didn't stop any of the aforementioned companies from dominating the technology world. The concept of Contraint Theory tells us that if you improve an area that is not your the largest bottleneck, you'll receive subdued benefits. Mathematics isn't the economic bottleneck any longer: Innovation is. "Sure, we're leading now, but in [insert 5-30 years here] we'll feel the impact." Oh puhleeze. That's what they said 30 years ago. The technology companies started above were founded by the students raised in this purportedly backwards mathematics educational system. What's more, if you consider the attributes that led to their success, it wasn't the mathematics anyway. No major companies are founded because someone somewhere was really good at integration. "People don't need advanced mathematics very often, but when they do, they really need it. " These days, most all advanced mathematics (that has any remotely practical use) can be done automatically. In fact, one of the few remaining pillars of mathematics academia just collapsed a few months ago, when Mathematica founder Stephen Wolfram released a free Calculus app for the iPhone. You can put in any equation, and it charts its integral and differential. And presto. Just like that, all the mathematics that people struggled through in High School AP Math can now done automatically and for free. Debates are now ongoing about whether students should be allowed to use this technology in schools, based upon the age-old arguments of using calculators in general. But, until recently, calculus teachers everywhere could rally around the argument that "Sure, you can do some math on a calculator, but if you need to calculus, you have to do it yourself!" For the first time in human history, that argument is now, permanently, dead. "Even if we don't absolutely need to be #1 in mathematics, surely it doesn't hurt. It can only help to be better in math." I have worked with many IIT grads, and if you can fully constrain the boundaries of a problem on a mathematical level, they're awesome. But unfortunately, in the real world, that virtually never happens. Most business problems are at least partially obscure, and partially philosophical or strategic -- and, here, hyper-quant-jocks (like IIT grads) do NOT shine. A national emphasis on math comes at a cost. If a country's best and brightest spend years pounding complex calculations, as in India and China, they are not spending years learning how to make things that are beautiful (Apple), innovative (Google), social (Facebook) or economically-game-changing (eBay). As a nation, The United States must not throw out what's really important, in pursuit of something that just seems important.